Every year on 3 February, San Nicolás Church in Bilbao hosts a special mass for hundreds of people to mark the feast day of San Blas. Known in English as Saint Blaise, this religious figure is, among other things, the patron saint of throats and it’s thought that wearing a blessed cord for nine days will help the wearer avoid colds, coughs and other related ailments, hence the interest in this annual service. Blaise was a physician and bishop in Sebastea in historical Armenia, and died in 316CE; he is also the patron of wool workers, stonecutters and vets. 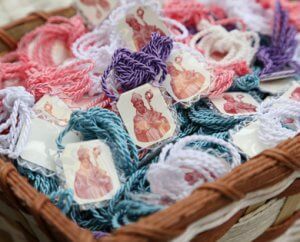 As well as the mass, the feast day of San Blas in Bilbao is marked by eating rosquillas (ring-shaped pastries) and marshmallow sweets that are sold on stalls along with the popular cords, which are available in a range of colours. In the nearby town of Abadiño, a traditional livestock and agricultural fair is also held as part of the celebrations; this year over 100 stalls feature local products including honey, cheese, vegetables and bread while there’ll be around 250 different animals on show. Where: Iglesia de San Nicolás, San Nicolás, 1.